The 21st Century Skills Map in Science was released about a month ago by the Partnership for 21st Century Skills. The maps are intended to be a resource to teachers, administrators, and policy makers as they look for examples of how to integrate technology with core subjects. The map encourages us to facilitate the use of web 2.0 tools with students as they are learning science. 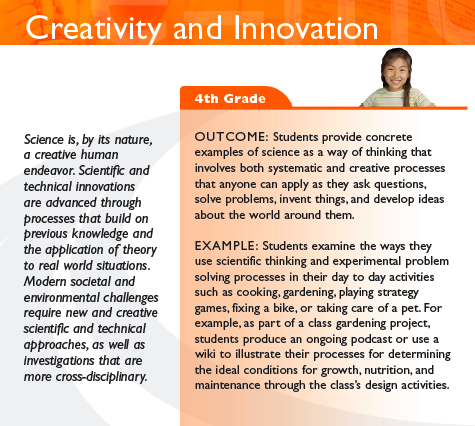 The map is organized into categories such as “Creativity and Innovation” and gives outcomes and examples at grades 4, 8, and 12. See the example below. Applications for Science Teachers: As classroom teachers consider how to maximize the use of technology in teaching science skills and concepts, this map could be a useful starting place for maximizing some lessons or units. This map could also me useful for building and district level administrators as well as technology specialists.